As a flexible all-season venue with 8 different event spaces, our sales and service teams specialize in vibrant spring weddings, lavish summer ceremonies, twilight autumn weddings and indoor winter weddings where up to 300 guests are warmed by a floor to ceiling fireplace. 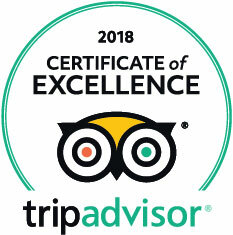 Each of our unique venues has been designed to ensure a successful celebration by enjoying a variety of event styles and effortless entertaining with family and friends. 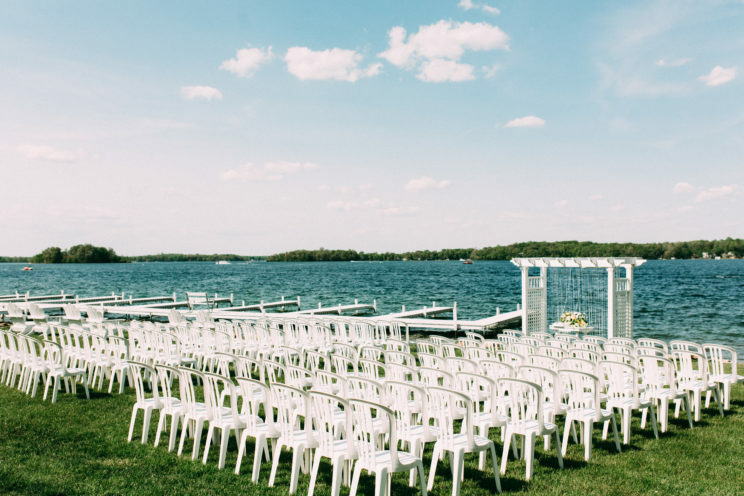 A unique outdoor waterfront setting for your dream ceremony. Opening June 2019 - Now Taking Wedding Reservations! The day you’ll always remember, deserves a location you’ll never forget— Bay Pointe Woods. Towering trees line the drive as you approach the new Bay Pointe Woods, a unique equestrian style venue with modern design features; it is a hidden jewel surrounded by ten stylish cottages, water and fire features, and picturesque gardens. All of nature’s natural beauty is brought to life and embraced in a single venue at Bay Pointe Woods, exuding sophistication, exquisite cuisine, and exceptional service — making it the ideal wedding venue. The Woods has a romantic ceremony site for up to 300 guests, this lush lawn area provides sunset views over the pergola surrounded by native landscaping. Walkways meander through the grounds of the woods showcasing water and fire features, intimate sitting areas and numerous trees, perennials and seasonal annuals providing abundant Instagram worthy spots to share your unique experience.. 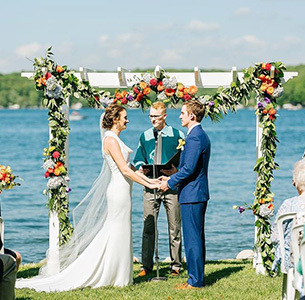 The Woods also has a secret up its sleeve — it not only serves as the dreamy locale of your reception, it can also serve as your ceremony location. 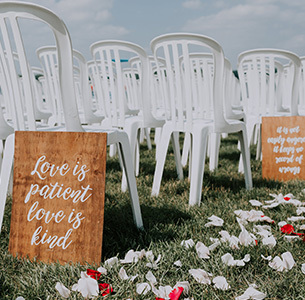 With these unique options, Its no wonder that Bay Pointe Woods is the new premier West Michigan wedding venue destination! The show-stopping centerpiece of Bay Pointe Woods is the Lawn, professionally adorned with blooming botanicals and accented with towering hardwoods. 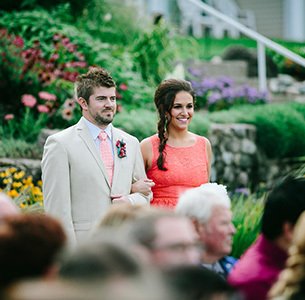 A stunning setting for outdoor weddings, it is designed with a couple’s ceremony in mind. A magnificent walkway winds through a lush lawn to an outdoor arbor where you can exchange vows before your loved ones. The Lawn is a dreamy option for couples looking for a romantic, nature inspired outdoor ceremony. Designed to host wedding receptions for up to 300 guests, the Bay Pointe Woods Ballroom is an exceptional venue with modern style elements, soaring ceilings and abundant natural light. Ralph Lauren lighting, wood floors, 2 bars, exposed barn beams and floor to ceiling stone fireplace complete the romantic ambiance. A 150 Ft. long covered porch wraps around the Woods Ballroom providing another location for pre-reception cocktailing and appetizers or an outdoor lounging space during your event with a sunset view overlooking the lush gardens. Ballroom Note: If guest count is 150+, guests MUST book the full Woods Ballroom. For events with fewer than 150 guests, the Woods Ballroom is split into smaller ballroom configurations, Laurel and Sycamore. In addition, only one wedding per day for 2019 at the Woods and the reservation must be for the Woods Ballroom or Laurel Ballroom on Fridays and Saturdays. Steeped in history and lavished with innovative updates, this exquisite Gun Lake Estate boasts 125’ of all-sport lake frontage. Built in 1886 this 5,000 sq. ft. ageless-beauty is comfortably elegant, magnificently custom, and totally endearing. Event space for up to 100 guests, up to 90 guests seated banquet style on the lakefront patio, a lakefront ceremony site for up to 90 guests, up to 40 guests seated in the upper courtyard, or up to 150 guests for a cocktail style celebration in the entire house. 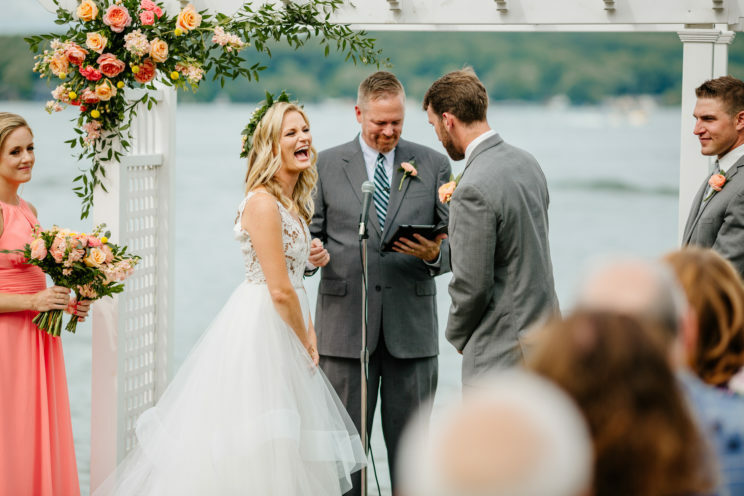 Wedding Setup: When hosting an event at the BoatHouse Villa, the ceremony, patio and courtyard setup for the day of your wedding is included in the rental fee. Setup includes an ice water display, unity table, use of the arbor, standard chairs for the ceremony, round tables, chairs, auxiliary tables, standard white linens, formal place settings and four tall cocktail tables for the reception. Steeped in history (circa 1886) with innovative updates, Bay Pointe's BoatHouse Villa is a historic Gun Lake estate boasting 125’ of private lake frontage. This 5,000 sq. ft. three level home is comfortably elegant and designed for entertaining. The Villa sleeps 15 with 4 bedrooms, 2.5 baths a loft and gourmet kitchen. The spacious furnished balcony offers sunrise and sunset views. The covered lakefront veranda offers a firewall and private dock. Game room has a pool table, shuffleboard table and bar, a second outdoor cabana bar is in the fountain courtyard. The grounds feature beautiful flower gardens and guests have access to all Bay Pointe Inn resort amenities. This unique villa provides event space for up to 100 guests, up to 90 guests seated banquet style on the lakefront patio, a lakefront ceremony site for up to 90 guests, up to 40 guests seated in the upper courtyard, or the entire villa accommodates a cocktail style celebration for up to 150 guests. *For the BoatHouse Villa, mid/high season weekend dates require a 3+ hosted bar package. Low Season: January – Memorial Weekend, October – December. High Season: Memorial Weekend – September. Additional BoatHouse nights may be available please speak with your Sales Manager for details. 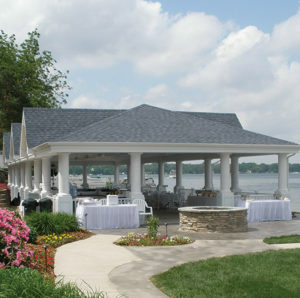 A unique waterfront setting for your dream wedding located on the water with seating up to 200 guests with over 3,000 square feet of adjacent lawn space. 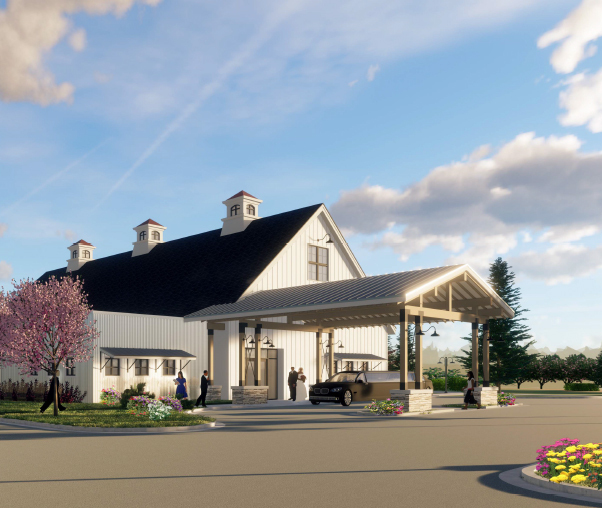 The space is surrounded by lush landscaping, a variety of perennials and seasonal flowers and features an outdoor gas fireplace, patio, gas torches, granite bar, ceiling mounted gas heaters, and clear sides we lower in the event of inclement weather to ensure total guest comfort. Rental includes a 14x16 dance floor, 4 tall cocktail tables, round tables, chairs and all auxiliary tables. All standard linen, dishware and barware also included. Boat slips available for rental. *Saturday events in the Pavilion require a 100 adult minimum and 4+ hour hosted bar. Sunday-Friday events in the Pavilion require a 50 adult minimum Sundays that fall during the holiday weekend will have Saturday rental pricing. The Island View Patio is the ideal location for your intimate morning or mid-afternoon wedding ceremony. Overlooking the islands of Gun Lake, it has a panoramic view of the water and shoreline. This space is a wonderful location for an outdoor bridal shower or rehearsal luncheon! 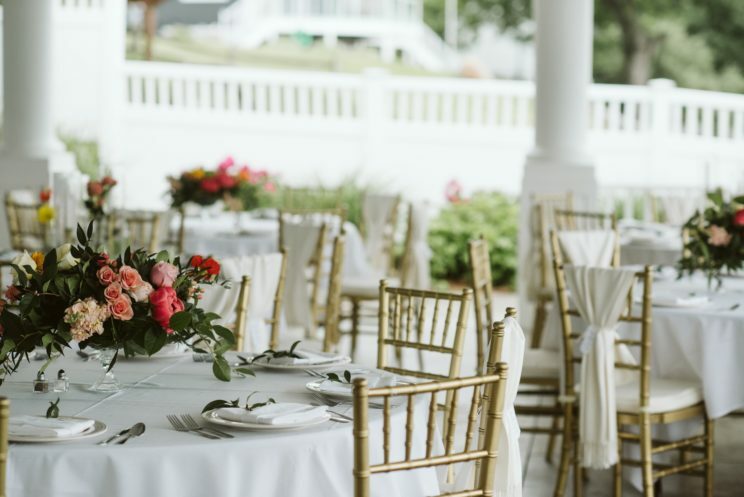 The Fireside Banquet Room is a perfect indoor space for intimate weddings, bridal and baby showers, rehearsal dinners, and a variety of social functions, seating capacity is up to 72 guests and features a grand 12’ fireplace and adjacent lakefront patio. An iPod docking station, portable bar, kitchenette, hand-held microphones, surround sound, a 144” drop down screen, ceiling mounted LCD-HD Projector, and free Wi-Fi is available. Terrace Grille is an award-winning farm to table restaurant. Aptly named for its lakefront terrace with panoramic island and garden views, Bay Pointe’s Executive Chef impresses guests with house made locally-sourced cuisine to satisfy the most seasoned palate. Terrace Grille is a true culinary gem that will delight your senses with a fresh seasonal menu, extensive wine selection, handcrafted cocktails and exceptional personalized service. Private Terrace Grille buy-outs are available. *Private rental not available after 4pm between Memorial Day and Labor Day, and specific holidays. Group reservations during restaurant hours available up to 24 guests. 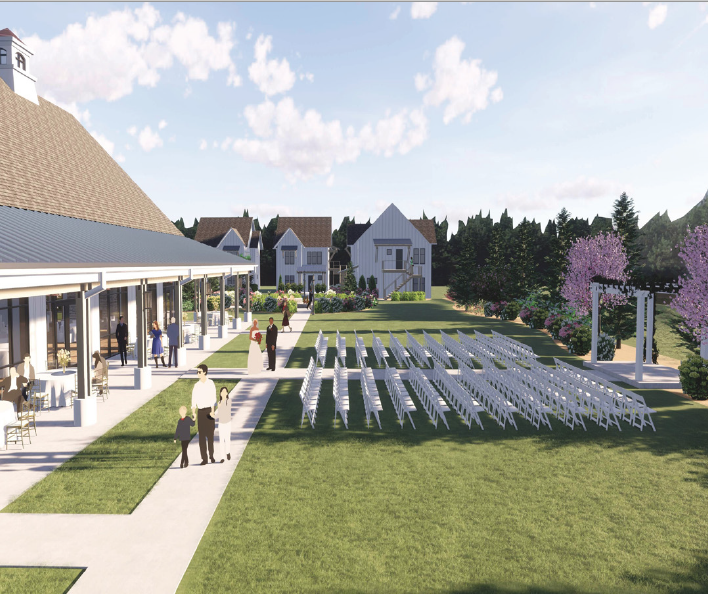 **At Bay Pointe, ceremony spaces are used in conjunction with reception bookings at the Woods, Pavilion, Fireside Banquet Room, Terrace Grille, or the BoatHouse Villa. 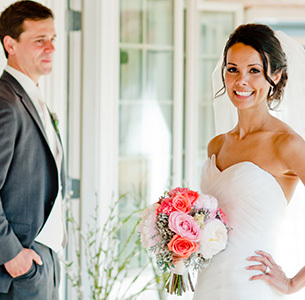 Bay Pointe does not host wedding ceremonies only. Minimums: Bay Pointe has food and beverage minimums for all venue rentals. Saturday rentals require a minimum 100 guests and 4 hour hosted bar.